The capital and political center of Switzerland, Bern sits on a peninsula formed by the U-shaped River Aare. To see ratings, reviews, other places to visit, and more tourist information, read Bern trip builder. London, UK to Bern is an approximately 5-hour combination of flight and bus. You can also take a train; or do a combination of car and train. The time zone difference when traveling from London to Bern is 1 hour. In July, plan for daily highs up to 28°C, and evening lows to 15°C. Cap off your sightseeing on the 2nd (Sun) early enough to go by car to Interlaken. Kick off your visit on the 2nd (Sun): let the river carry you with a rafting and tubing tour, examine the collection at Ballenberg, Swiss Open-Air Museum, and then glide through the air with a parasailing or paragliding tour. For photos, ratings, reviews, and tourist information, you can read our Interlaken holiday planner. Traveling by car from Bern to Interlaken takes an hour. Alternatively, you can take a train; or take a bus. In July, plan for daily highs up to 28°C, and evening lows to 15°C. Wrap up your sightseeing on the 3rd (Mon) to allow time to drive to Lucerne. On the 3rd (Mon), contemplate the waterfront views at Lake Lucerne, admire the masterpieces at Sammlung Rosengart, and then take in the awesome beauty at Mt Pilatus. For more things to do, ratings, and tourist information, read our Lucerne vacation trip planner. You can drive from Interlaken to Lucerne in an hour. Another option is to take a train. In July, plan for daily highs up to 30°C, and evening lows to 17°C. 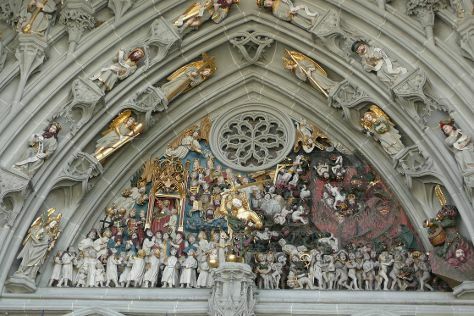 Finish your sightseeing early on the 4th (Tue) to allow enough time to drive to Zurich. On the 4th (Tue), explore the activities along Lake Zurich, appreciate the extensive heritage of Old Town (Altstadt), and then take in the architecture and atmosphere at Grossmunster. To see reviews, other places to visit, where to stay, and more tourist information, go to the Zurich itinerary planner. Traveling by car from Lucerne to Zurich takes an hour. Alternatively, you can take a train. In July, plan for daily highs up to 30°C, and evening lows to 17°C. Finish your sightseeing early on the 4th (Tue) so you can travel back home.